MONAHANS -- Last Monday, a seemingly normal track and field practice at Monahan’s high ended abruptly. Sophomore Isaiah McCalister had fallen to the ground after a sprint, and couldn't get up. His teammates alerted their coach that's when they called 911 and performed CPR. “They knew it was something serious. They were telling each other, encouraging him get up, get up, and they knew right quick” says Coach Chris Simpson. 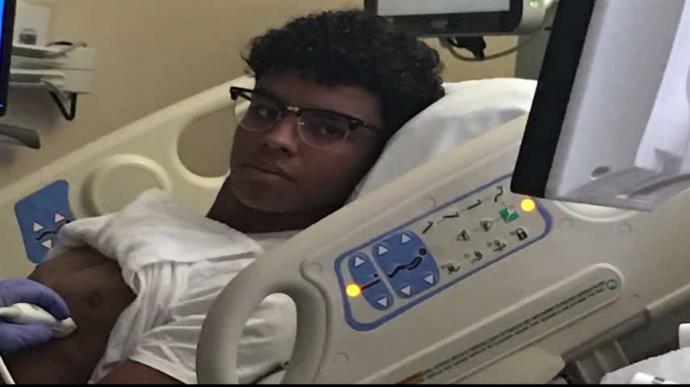 Turns out Isaiah had the heart condition Wolff-Parkinson-white syndrome and it caused Monday’s cardiac arrest but the family didn't know about it until after he collapsed on the track. “It doesn't matter about the money... It's either get an EKG done or you find yourself in this situation. It's worse to not have them here, than to pay for that. Hopefully it'll be part of physicals” said Marcela McCalister. Marcela, Isaiah’s mom, is grateful to the staff and teammates for looking after Isaiah. "He’s a walking miracle. Thanks to Coach Simpson." And his coach is just happy Isaiah was able to get treatment and is already back at school. "Kids are resilient. I think the fact he was playing sports all year not only triggered it, but it also saved his life” Coach Simpson says. Marcela says as her son was being released from the hospital, Isaiah’s mind was still on the track. He even asked to stop by the track meet in Andrews to see who was replacing him as the anchor. McCalister won't be competing this season, but should be cleared by next year. Dr. Richard Bartlett says he was born with the heart problem but after the ablation his heart is stronger than ever. Bartlett urges people to learn CPR, which he says saves lives like it did last week with Isaiah.